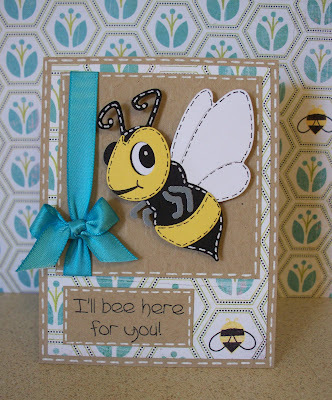 CottageBLOG: I'll bee here for you! Hello and happy Sunday to you all! For my card today I used the Bee Shape die. I just think he's adorable! I hope you're having a relaxing day! See you back here next Sunday. Have a wonderful week! Awwwww... this is as cute as can BEE, Nikki! Love the DP, too. Great choice!! Perfect choice for the paper!! I just love the SC Bee!! I keep thinking I need to order this but haven't yet. It's back on my list again after seeing your sweet card! Indeed, he is adorable! Great card altogether! TFS. I love what you did with the bee. There are so many cute bee sayings out there that this die is a must have. Love the bold ribbon next to the bee to make it pop. Nikki this is so cute! The paper and ribbon are perfect for that adorable bee!